I still remember when I won my first literary competition. It was 1998 and I was a second-year creative writing student. My tutor that year had urged us to start sending our work out, had counselled us that we would likely fail more than we would succeed but if we really wanted to be writers we must persist. I remember him holding up a sheaf of papers, a catalogue of his rejections, and feeling heartened. I don’t recall how many competitions I entered before I won my first, but I don’t think it was many. What I do recall is the thrill of that win. The validation I felt. Somebody thought my words mattered. To confirm this there was an award ceremony, a trophy, a modest cheque, publication in an anthology, and an article in the local paper. It was all rather dizzying. I didn’t realise at the time that most competitions offer little reward. A certificate to be filed away and a few hundred dollars to be banked, but rarely publication. Which is why this anthology is such a gem. 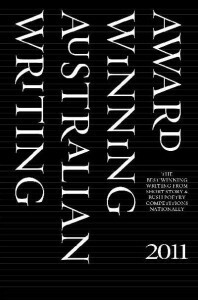 Now in its fourth year, the 2011 edition of Award Winning Australian Writing (AWAW) has collected 46 winning entries, both stories and poems, giving them a life beyond the competitions. Each story is accompanied by an author bio and an informative blurb about the competition itself. This makes it a useful tool for writers engaged in the enterprise of entering literary competitions. In particular, it is ideal for creative writing students. Back in 1998, as I began dipping my toe into the mystifying world of publishing, I hadn’t the faintest clue what competition judges were looking for. What, precisely, did a winning story look like? I blindly sent my work out into the great unknown with a kind of scatter gun approach and hoped for the best. A book like AWAW would have been a great help in working out how to be more strategic. As Delia Falconer notes in the Foreword, strategy is not just about increasing the chances of success but also about ‘conserving energy’ and protecting yourself from ‘constant rejection’. Incidentally it was Falconer who awarded an early story of mine in the Banjo Paterson Writing Awards and wrote lovely and insightful things about it in her judge’s report. I treasured this feedback from an author I admired, and this is one of the benefits of entering these competitions. So, AWAW is a valuable resource indeed, but what of its contents this year? Despite being a collection of award-winning works the quality of the writing is uneven. This reflects the range of competitions included – from those with minimal prize money and a local focus to more lucrative prestigious national awards that attract international entries. The authors included are also at varying stages of their careers. The clear standout is Sarah Holland-Batt’s ‘Istanbul’, winner of the Adelaide Review/University of Adelaide Creative Writing Program Short Fiction Competition (unwieldy names seem to be obligatory for literary competitions). Holland-Batt displays a poetic attention to the rhythm of language and an ear for dialogue. Her observations of the minutiae of life and evocation of place are skilfully handled. With elegant prose she captures the endless languor of summer holidays and the agonies of youth. I read this story twice and enjoyed it just as much the second time. The Boy closes his eyes. Listens to The Father fade away. Raises his eyes to his mother. Sees the imploring face. Clumps his own way across the kitchen floor. Opposite direction to The Father. Leaves The Mother with her hand stoppering her mouth. Other favourites include Theresa Layton’s ‘The Afghan Hook’ (Perilous Adventures Short Story Competition) about a woman who decides to leave her husband on their fiftieth anniversary, then wavers. The small cruelties of this relationship have eroded it over time: ‘Her case against him has built, slowly, in sedimentary layers’. This well-crafted narrative is a gem. And then there’s Leah Swann’s moving story, ‘Street Sweeper’ (Page Seventeen Short Story Competition). As in Tucker’s story, a beloved dog is killed, this time by a car. The event, witnessed by the dog’s owner, 14-year-old Mathew, is pivotal in this coming of age tale and Swann handles it with deftness. She also pulls off the difficult to master second person narrative mode with assurance. Other notable stories are Karen Heenan’s ‘Beyond the Bay’ (Hal Porter Short Story Competition), Jacqueline Winn’s ‘The Dangers of Swimming’ (Banjo Paterson Writing Awards), and Kate Rotherham’s ‘A Favourite Sky’ (Rolf Boldrewood Literary Awards). Poetry has also been included in AWAW for the first time and it is a welcome addition. Kevin Gilliam’s ‘the unwritten blue’ is a poignant poem that displays a fine observation for detail. 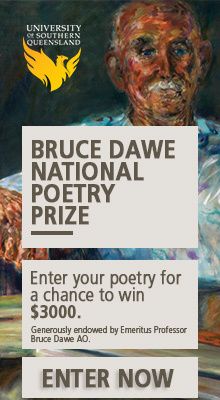 It won the Reason-Brisbane Poetry Prize, one of the most lucrative poetry prizes in the country, sponsored by writer Joy Brisbane whose aim is to nurture both new and established poets. Irene Wilkie’s ‘Living Sculpture’ (Grenfell Henry Lawson Festival of the Arts Literary Competition) is both evocative and vivid, and I enjoyed Gemma White’s wry take on personal ads in ‘Wanted: Poet’ (Picaro Poetry Prize). Finally, one can’t go past KA Nelson’s powerful political poem ‘Chorus of Crows’, winner of Australia’s most prestigious prize for new and emerging poets, our very own Overland Judith Wright Poetry Prize. Overall this is a collection with much to offer and a must read for those interested in entering Australia’s array of literary competitions. Does it include the SF award winners, say Angela Slatter’s Aurealis award-winning stories? Rjurik, the Aurealis winner isn’t included but there are other genre fiction comp winners. The Australian Horror Writers Association Short Story Comp and the Katharine Susannah Prichard Speculative Fiction Awards, for example. Hmm. Seems a a pretty big oversight. I’m guessing no Ditmar either then, which might be less of a problem but still not ideal. Anthologies like this are tricky because by necessity there will be omissions, and each year they need to showcase different competitions. I actually thought they struck the right note with the range included, from small local comps to larger more prestigious ones, and across the range of genres. Rjurik, it’s not so much an oversight as an attempt at being democratic. Each year there are more award-winners than we can publish, and selecting what goes in the anthology is a juggling act between numerous considerations. The Aurealis Awards have, in fact, been represented in the anthology, albeit earlier — in the 2009 and the 2010 editions (Cat Sparks and Ian McHugh, respectively). Likewise, in 2009 a Ditmar Award–winner (Margo Lanagan) was included. In addition to the genre-fiction competitions listed above, there’s also the Shades of Sentience Steampunk Short Story Competition (Amanda J. Spedding). The full list of included competitions/pieces can be read here: http://www.melbournebooks.com.au/awaw2011contents.html. Yes, of course there are probably more award-winners than you can fit into one book. And there’s a balance you’d have to make. Still, someone like Angela Slatter seems to me to be a pretty significant writer, and the Aurealis Awards the most significant of the speculative fiction awards. Literary and liberal democracies support war for power and profit: so much for The Year of Quarreling Over Anthology Choices. Guess you’ve got to pick the right, left aspects of a quarrel.